Partners for Possibility (PfP), a South African social enterprise that develops leadership capacity in under-resourced schools across the country, is a finalist in the global World Innovation Summit for Education (WISE) Awards. The announcement of was made this morning by the Qatar Foundation, which created the WISE Awards in 2009. Every year it evaluates hundreds of innovations in basic education before ultimately selecting six winners to be showcased at its WISE Summit in Qatar and receive $20 000 in prize money. Since its inception, the judges for the WISE Awards have evaluated over 2 400 nominations for the Awards from over 150 countries and have awarded just 54 prizes, to social innovations in countries as far afield as Finland, the USA, Spain, Morocco and India. Partners for Possibility was founded in 2010 as a leadership development and principal support programme that brings together a school principal of an under-resourced school and a business leader in a year-long developmental partnership. The partnership participates in an accredited leadership development process while at the same time working together to develop solutions to the challenges faced by its specific school. Since starting at its first school in Cape Town, the programme has grown to over 720 schools across South Africa. “Our programme provides the much-needed support and leadership skills to school principals who have received little or no preparation for the challenging task of managing a complex organisation with very limited funds amidst crippling social challenges such as poverty, child-headed households, drug abuse and gangsterism. “Aside from supporting the principal and partnering him or her with a business leader who works and learns as an equal alongside them, the programme also creates fertile ground for further interventions and support from business and social change organisations,” says Van Rhyn. Partners for Possibility’s unique concept of combining leadership development with social support to principals of under-resourced schools has received wide acclaim since 2010. The global platform HR.com has selected Partners for Possibility as one of its Top International Leadership Providers in 2016 and 2017, and NGO Adviser selected PfP – the only social enterprise on its list from South Africa – as one of the top 100 NGOs in the world in 2018. “Being a WISE Finalist will also offer PfP a global platform to share its insights and solutions as well as how these could be applied to other industries and countries. We look forward to networking with other global finalists who share our passion for quality education for all children,” says Van Rhyn. It is estimated that 80% or 20 000 public schools in South Africa are “in crisis” or under-resourced and in need of support. 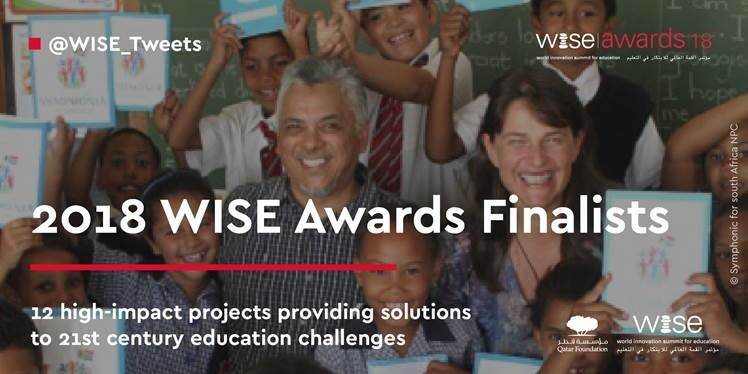 An evaluation team from the WISE Awards will soon travel to South Africa to experience the programme first hand and to interview alumni and other key programme stakeholders. The winners are set to be announced in September 2018 during the biennial WISE Summit. “Brand South Africa is delighted to hear that Partners for Possibility have been announced as a WISE Awards Finalist. These awards are a testament that giving back to communities does not go unrecognised”, said Brand South Africa’s GM: Stakeholder, Ms Mpumi Mabuza.